IT’S the ‘Little Things’ that count for these happy One Direction fans. The Speakman family’s dreams came true when they got to see their pop idols in the flesh thanks to a little help from The Gazette. As reported last week, Kirsty Speakman, of Prenton Gardens, Norcross, and three of her children were left devastated after discovering they had bought fake tickets to see boy band One Direction, in Manchester, on Saturday. 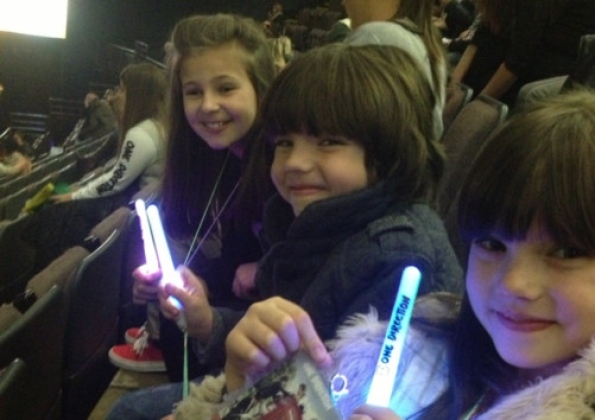 However, a ticketing company contacted The Gazette to offer Katie, 11, Harry, eight, and Amber, five, complimentary seats to the concert after reading about their plight. Mum-of-six Kirsty, 32, accompanied the happy trio to the gig at the Manchester Arena. She said: “I couldn’t believe it. They absolutely loved it and the seats were really good. “We were pretty much eye level with the stage. “The concert was mostly for the kids and there were so many screaming girls there, it was just phenomenal. Kirsty also thanked The Gazette for its part in helping to secure the tickets. She added: “Thank you so much for what you have done. A heartless fraudster had conned the family out of £270 on internet auction site, eBay. Indoor adventure firm Kaos, in Lytham, had also read the story and offered the children free entry on Saturday afternoon. Ticket firm Viagogo spokesman Ed Parkinson said: “We were really sorry to hear about Kirsty’s upsetting experience and wanted to make sure her family didn’t miss out on seeing the show.